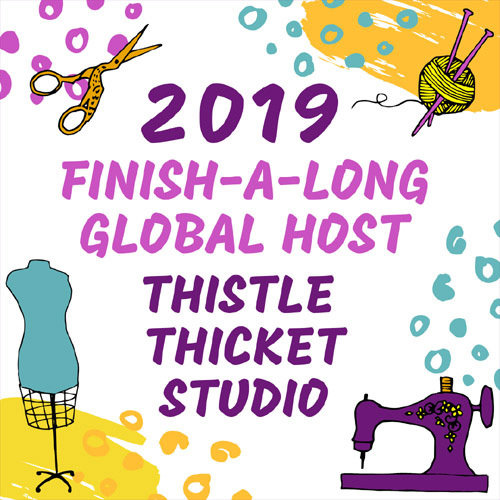 Once again, I only have one finish to link up for the Finish-A-Long this quarter - but, it was a great finish and I'm pleased to have it off my to-do list. The Lego Batman quilt was a labor of love and a gift for my superhero loving grandson. It's been on my FAL quarterly goals for a year now (see my Q1 goals here). 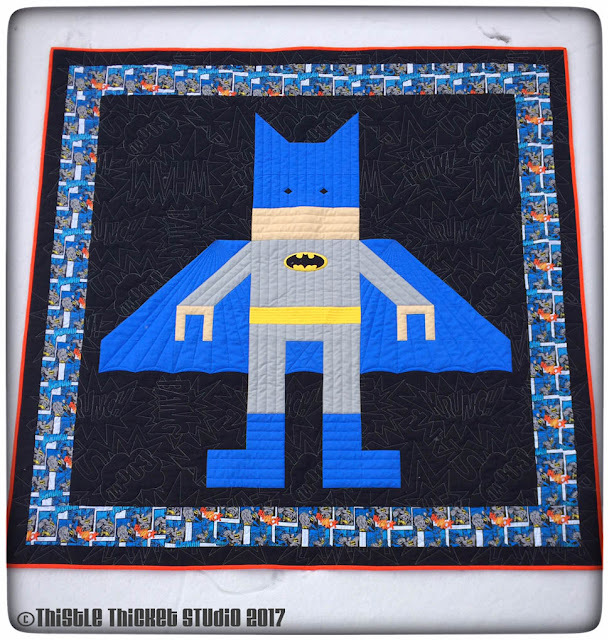 The Batman Lego quilt was completed before the hubby and I left for our annual snowbird trek south during January and February. That trek is part of the reason I only have one finish this quarter, plus the 3 weeks I was sick after returning home. Both left me with no quilting mojo, but happily I'm starting to find it again. 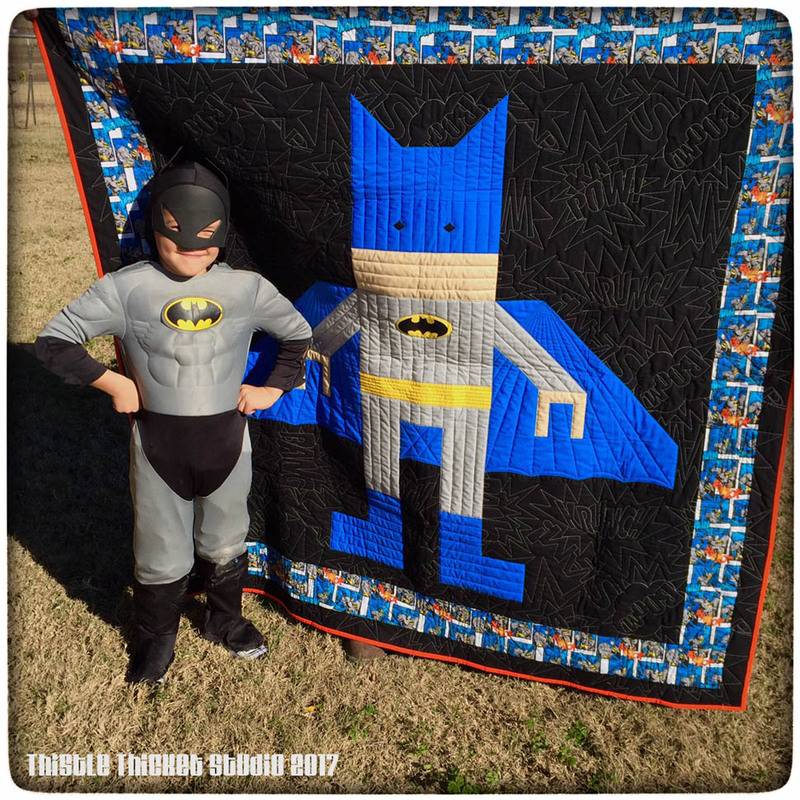 I'm linking up this post with the 2017 Finish-A-Long 1st quarter link up. Haven't heard of the FAL, go check it out here. It was a busy week, but I managed to get my fair share of quilting in this week - that hasn't happened in awhile! My goal was to get all of my wavy flying geese sections - 15 in all - made. Yay, I actually got them done! 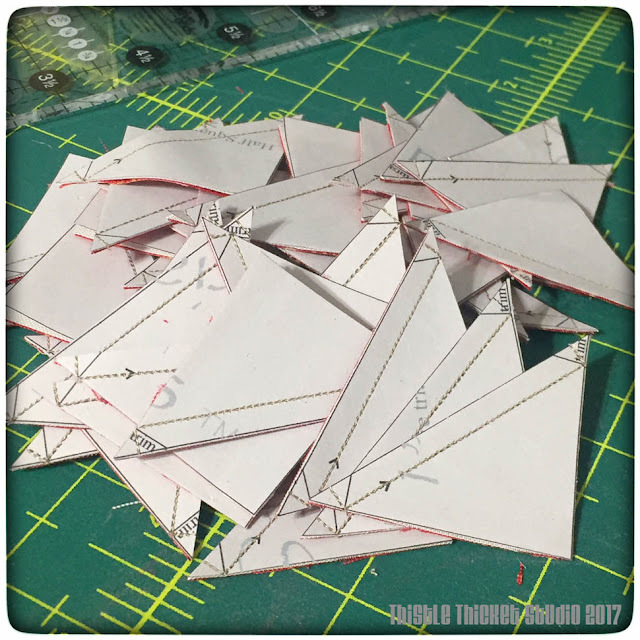 I shared in my last post that I had designed my own paper piecing pattern for my wavy flying geese for the next row in our quilt guild's row quilt challenge. 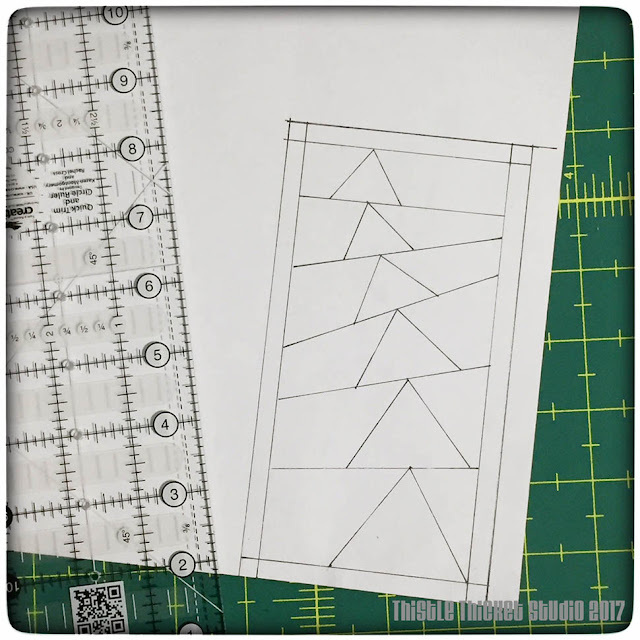 Well, after sewing the first three segments of this pattern, it dawned on me that I had drawn the pattern wrong. How many of you looked at that photo last week & said "Pffftt! That'll never work!" So it was back to the drawing board. I studied a pattern of flying geese made in a circle and realized that the sew line of the background pieces had to extend out to the edge of the pattern each time to make it sewable (if that makes sense). After a little time redrawing my pattern, scanning it into the computer, and creating a mirror image for the other half of the 'wave', I was back in business. I just need to sew the sections together into a 60" row before our April quilt guild meeting. The highlight of my week was a group of my quilty friends who call themselves the "Dine & Dash Quilters" got together to present the friendship quilt we made for one of our friends. 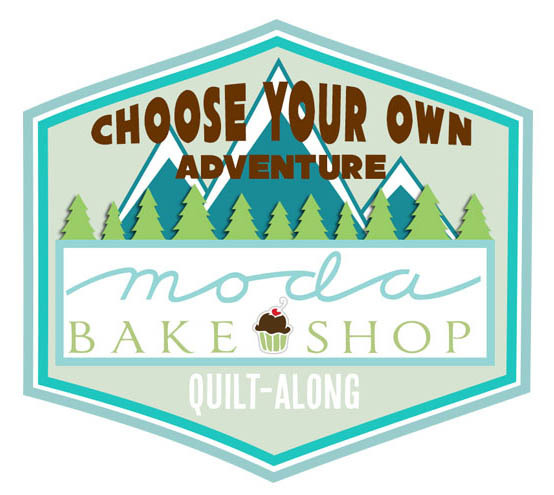 (I don't know why I didn't take any photos of the quilt): It's always fun to get together over good food & visit & share our latest quilting projects. I'm in charge of the next friendship quilt, so I made a block to show what the next one will look like. This quilt will be different than anything the group has done before. 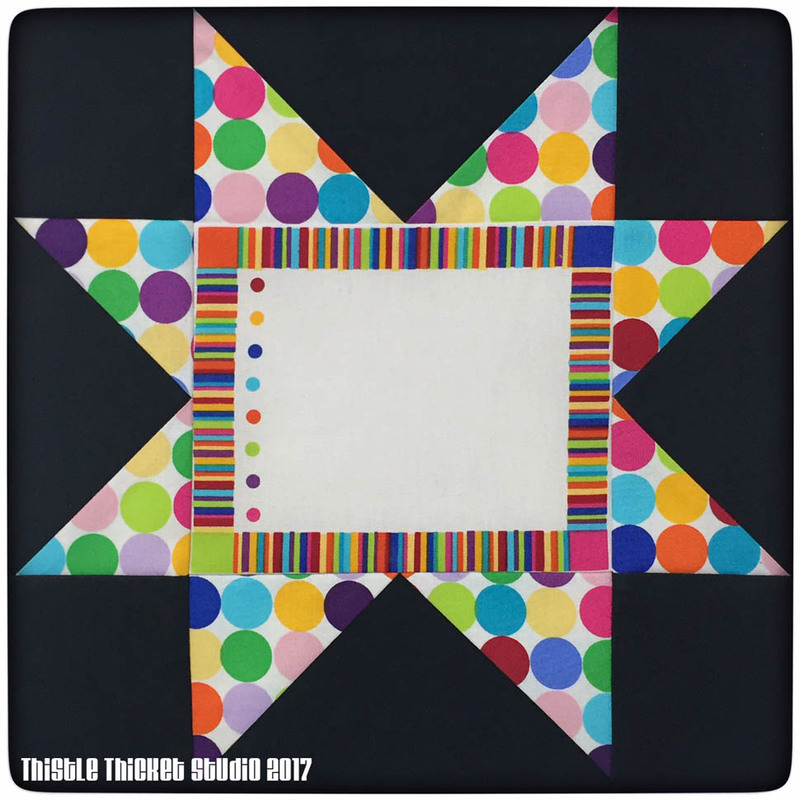 The pattern is called "Saw-tooth Stars & Signatures" and features a quilt label in the center of the stars for signing. 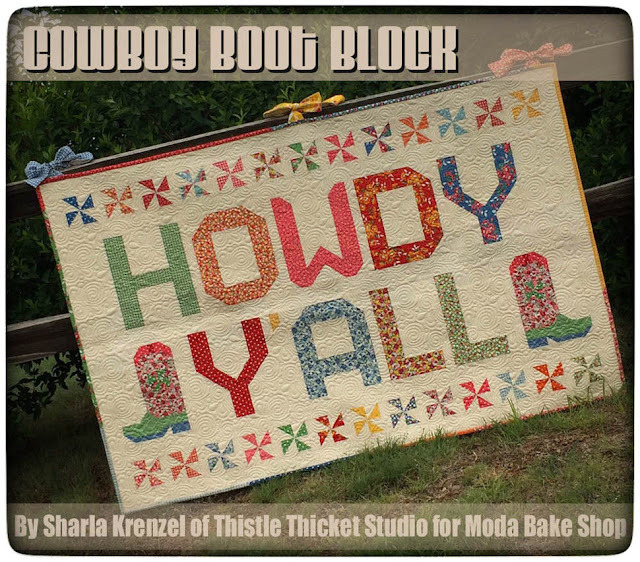 This week a few of us will get together to make block kits in preparation for our next sew day. 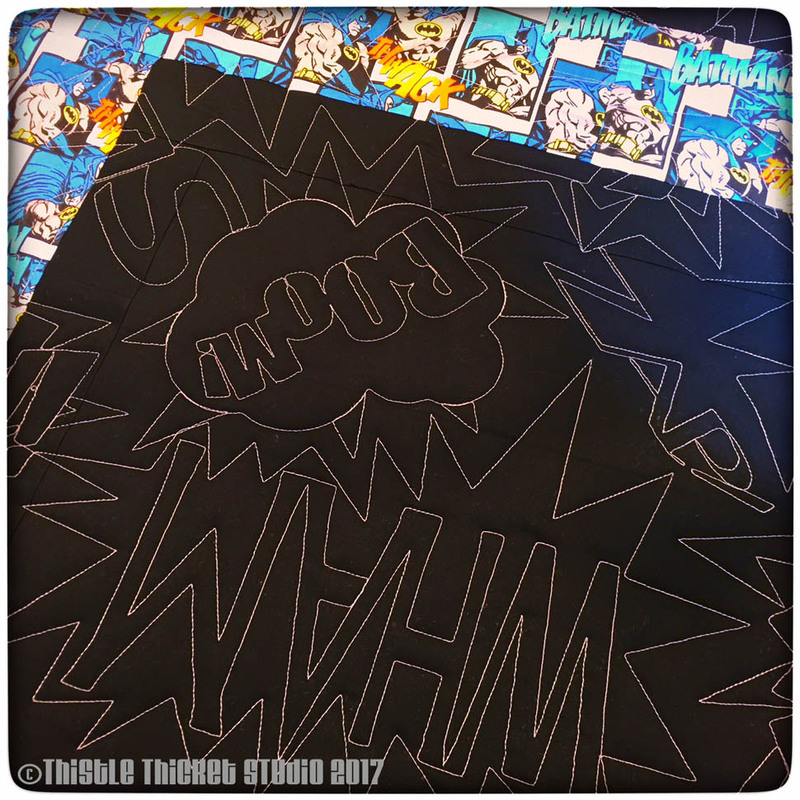 I received some happy mail this week - the second of my Instagram giveaway winnings. This one is from Summer @summer_stitcher & it is awesome! 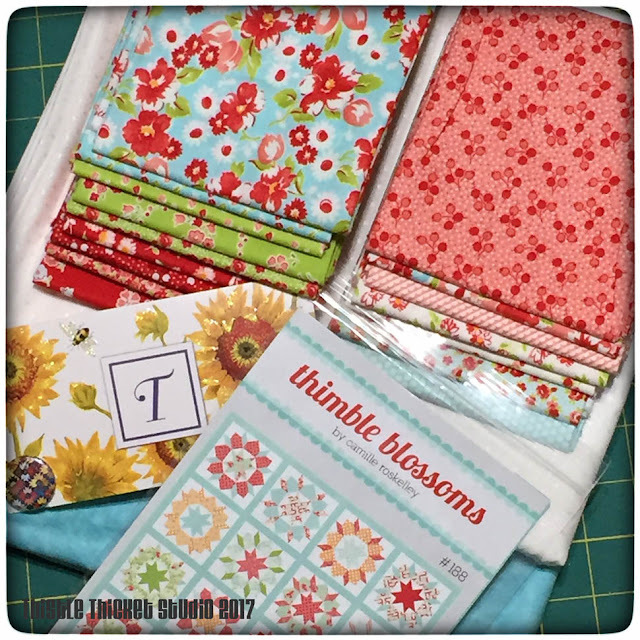 It's a complete kit to make Thimble Blossoms "Swoon Sixteen" quilt top featuring Bonnie & Camille fabric! I've had this one on my bucket list and I can't wait to get started (but I have several WIPs on the list to finish first.) Thank you so much Summer!!! And I hit a milestone on Instagram - 1000 followers! 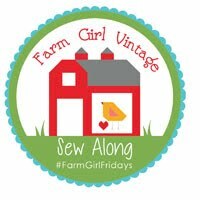 So I hosted my own little giveaway that Mary Ann of Little House On The Dairy won. 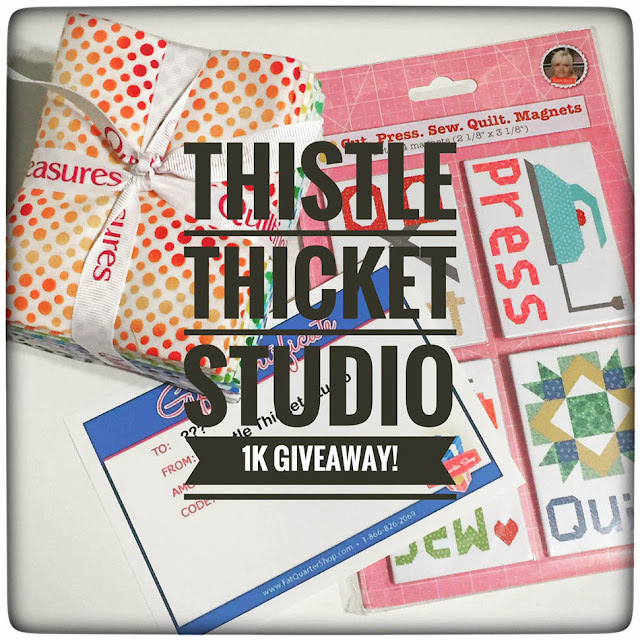 The giveaway was for 10 fat quarters of Quilting Treasures Ombre Dots, a set of Lori Holt's (Bee In My Bonnet) Cut. Press. Sew. Quilt. magnets, and a $25 gift certificate to the Fat Quarter Shop. Congrats Mary Ann! 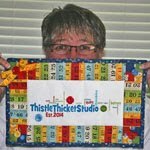 I'm looking forward to another week of some quilty fun, how about you? I've been on Instagram for almost 3 years. Over that time I've liked, commented, tagged and reposted hundreds of giveaways - all with no success - until now. Last week, I won not one, but two giveaways! I'm beyond excited! Today, I received the first one - Quilt-Pro 6. 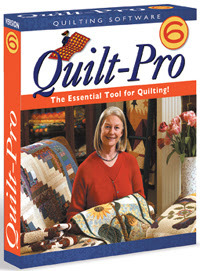 Quilt-Pro is design software for quilters from Quilt-Pro Systems. It designs blocks and quilts. You can add fabrics to those designs. 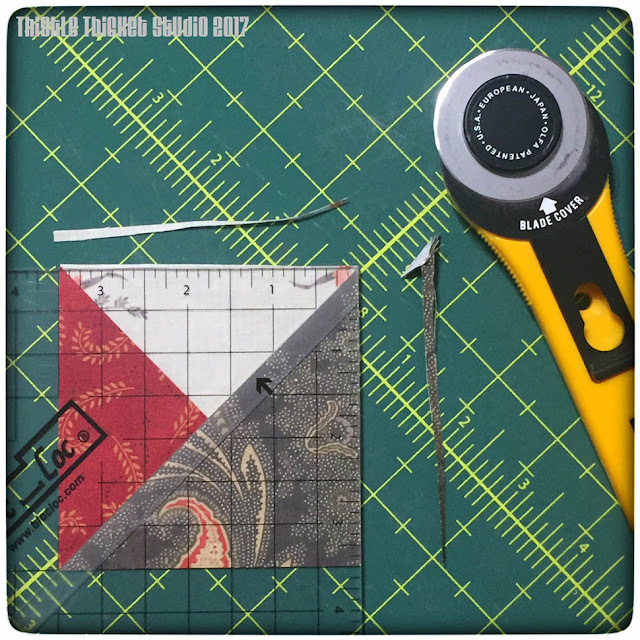 Then you can print strip piecing charts, foundations and templates, and fabric yardage estimates. Hmmm, if it only did the sewing too, maybe I'd get caught up on some of my projects! Seriously, I am so extremely appreciative for this gift and can't wait to learn how to use this software. Thank you Quilt-Pro Systems!!! Now to find some time to do some binge watching on Quilt-Pro's You Tube Channel and start creating some quilty goodness! 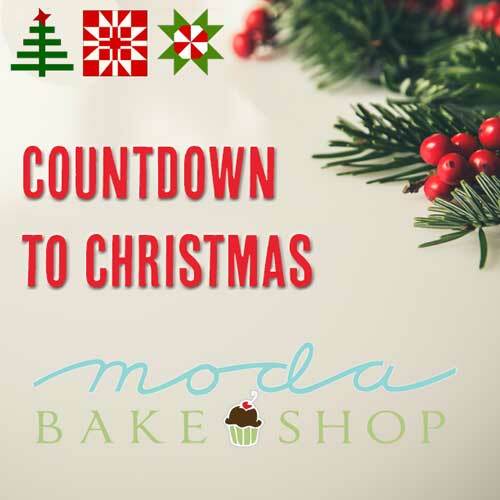 Click on the link and check out their how-to videos too! 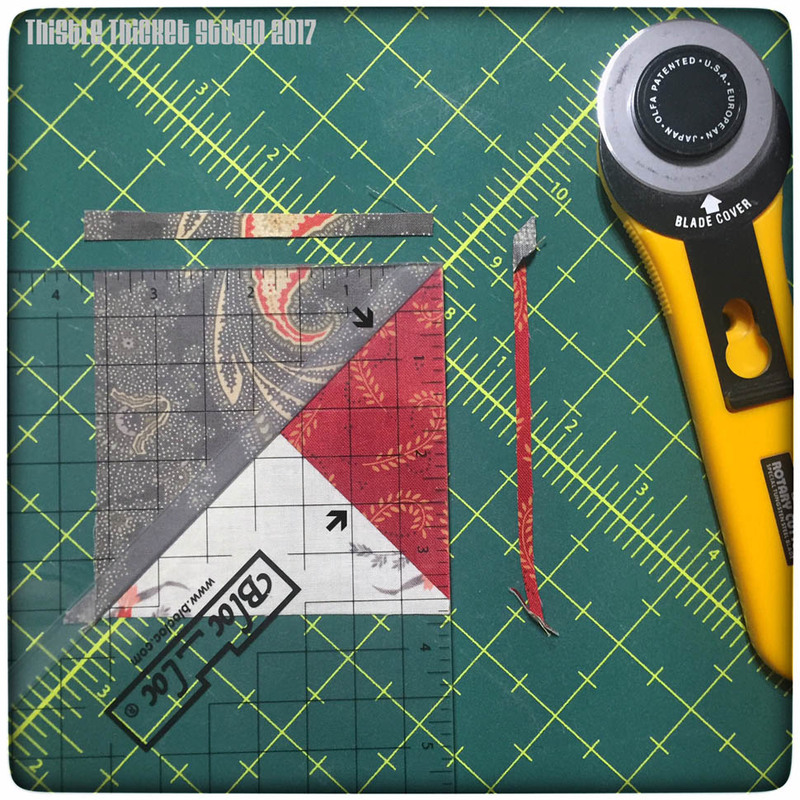 Who else uses Quilt-Pro? Help a girl out and share any tips or tricks you know! Thanks! 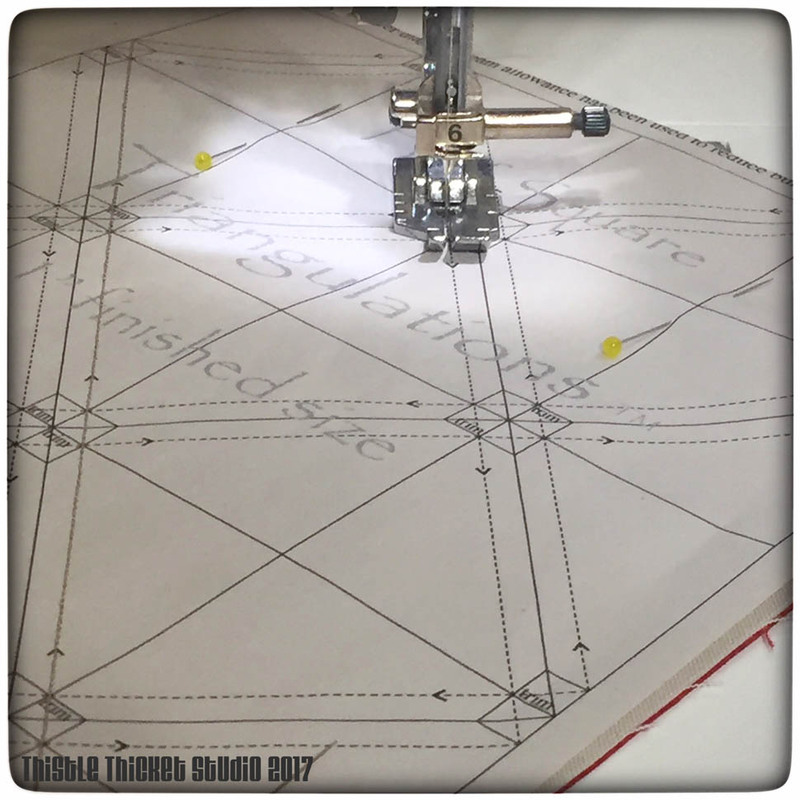 This past week I spent some quality time at my sewing machine playing catch-up on my quilt guild row quilt challenge. Before the hubby and I left for our snowbirding jaunt to Texas in January, I had completed the first month's row - a 9-patch medley. 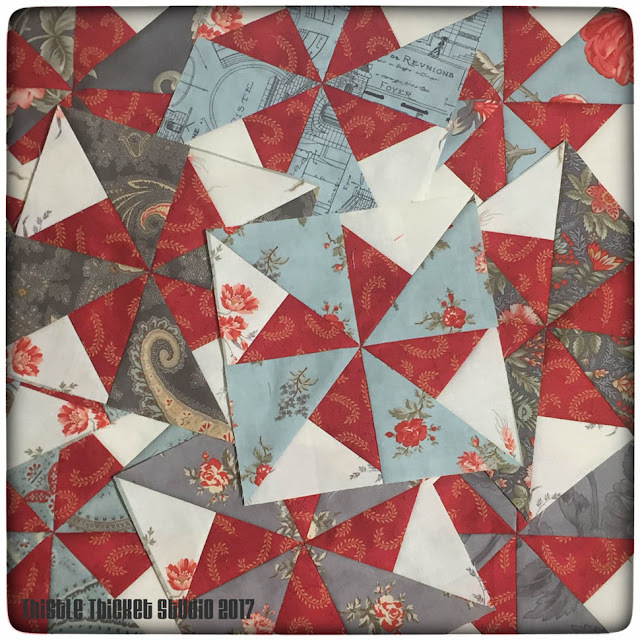 But while we were traveling, my quilt guild met twice, drawing double pinwheels for month 2 and bear's claw for month 3. The double pinwheels went together quickly, thanks to my Bloc-Loc half square triangle ruler. 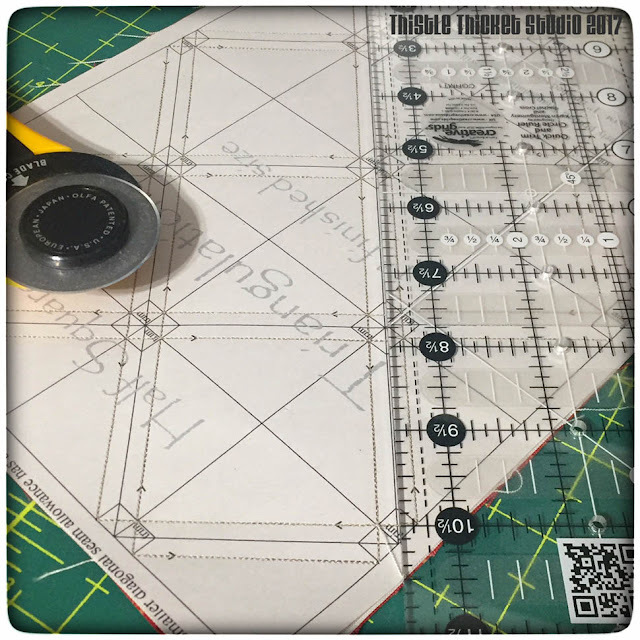 This ruler is great for squaring up half square & quarter square triangle blocks. To square up my double pinwheel blocks, I took each quarter section and laid the Bloc-Loc ruler with the center grooved edge on my half square seam (top arrow) and lined up the 3 1/2" mark on the edge of the ruler on the quarter square seam, making sure that the corners of the markings along the 45 degree angle lined up on my quarter square seam (bottom arrow). When everything was lined up, I trimmed the top and right side of the square. 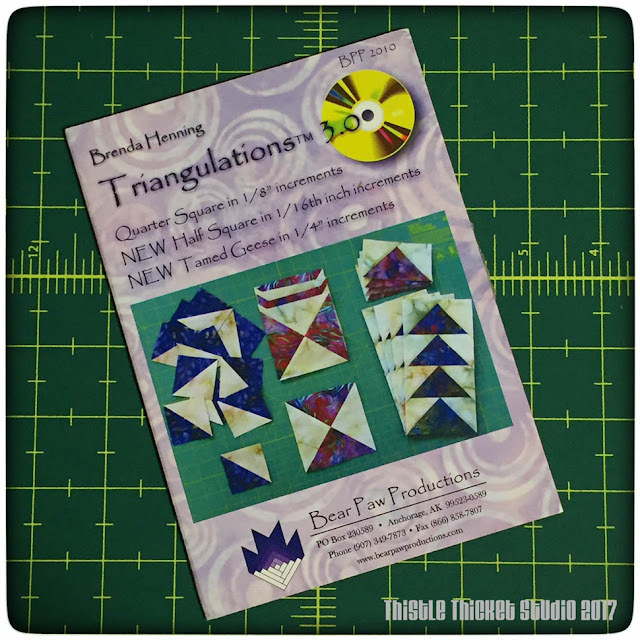 For the bear's claw blocks, I used another one of my favorite tools - the Triangulations CD by Brenda Henning (again, no affiliation). From the CD, you can print paper piecing patterns for half square & quarter square triangles & flying geese blocks in a multitude of sizes. It's great if you are making lots of blocks using the same fabrics. Once I printed my patterns, I determined how many blocks I needed and cut my two pieces of fabric 1/2" larger than the pattern. With the two fabrics right sides together, I pinned the pattern on top, then sewed on the dotted lines. I used a smaller stitch to help perforate the paper to make it easier to remove. Once all the dotted lines were sewn, I cut the half square triangles apart along all of the solid lines. In no time at all, I had a pile of half square triangle blocks! I pressed my blocks open, then removed the paper. With those little 1" half squares done, the rest of the bear's paw blocks went together easily. Since my first two rows are each 6", I decided to make my bear's paws 3" then added a 1" strip on two sides of the block so that the blocks were offset along the row, and measured 4" finished (all measurements mentioned are finished sizes). Hopefully it looks like the bear's paws are walking across the quilt. Making the row 4" also adds some variety in the size of the rows and will help keep the quilt from getting too long. With my three rows complete, I'm caught up on this challenge. 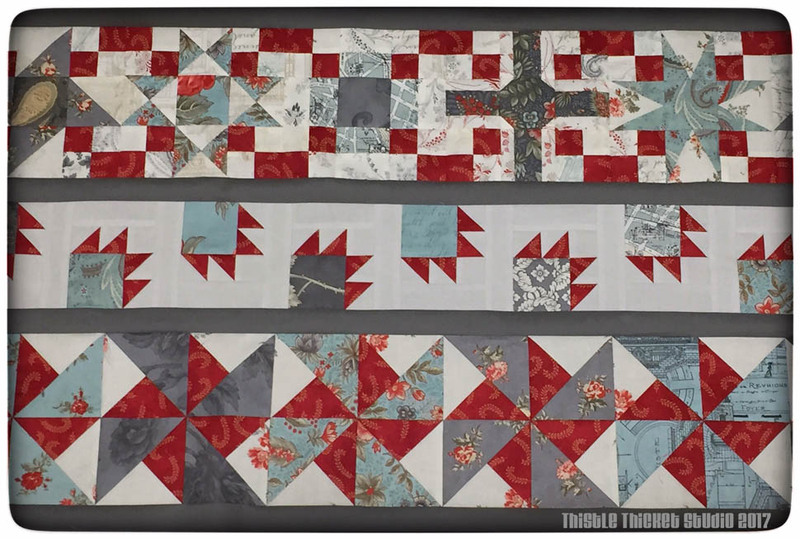 I am putting a 1" sashing between each row to separate them and I think it helps tame the busy look of the quilt. Actually, I was caught up on this challenge for only a day. Yesterday my quilt guild had a sew day and drew for the next row - flying geese. 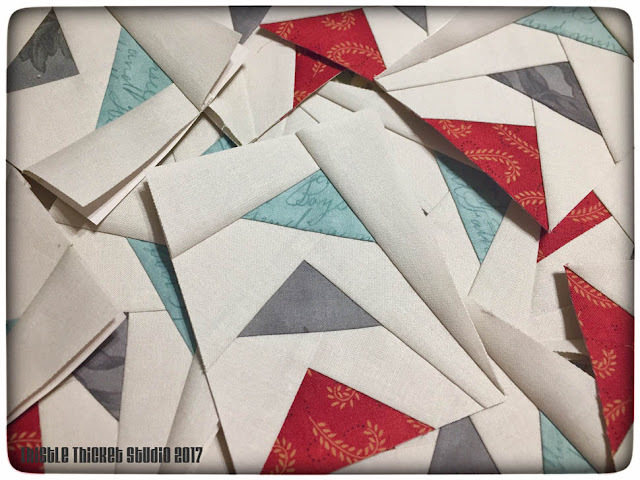 I came home & designed a paper piecing pattern for a 3" row with geese (that really look more like triangles) that will fly across the row in a wavy pattern. 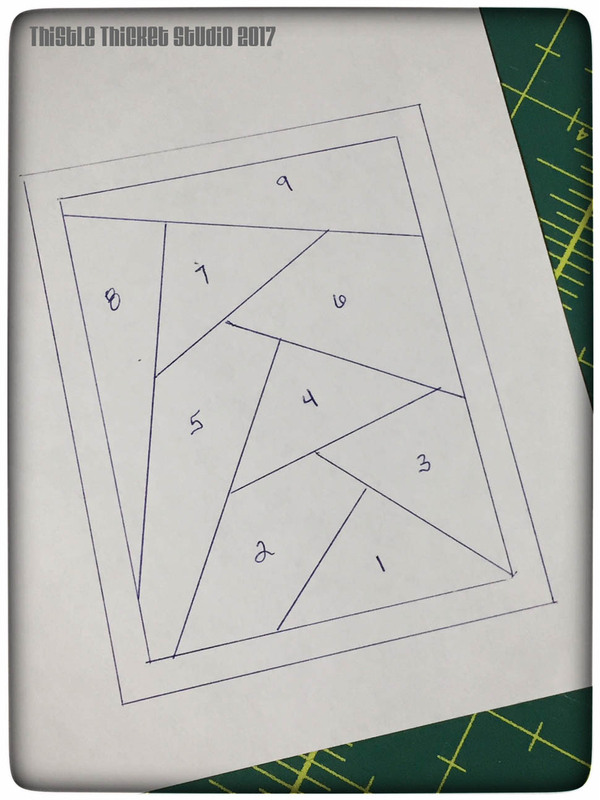 This is my first foray in designing my own paper piecing pattern, so hopefully it will work. Fingers crossed! What's under your needle this week? 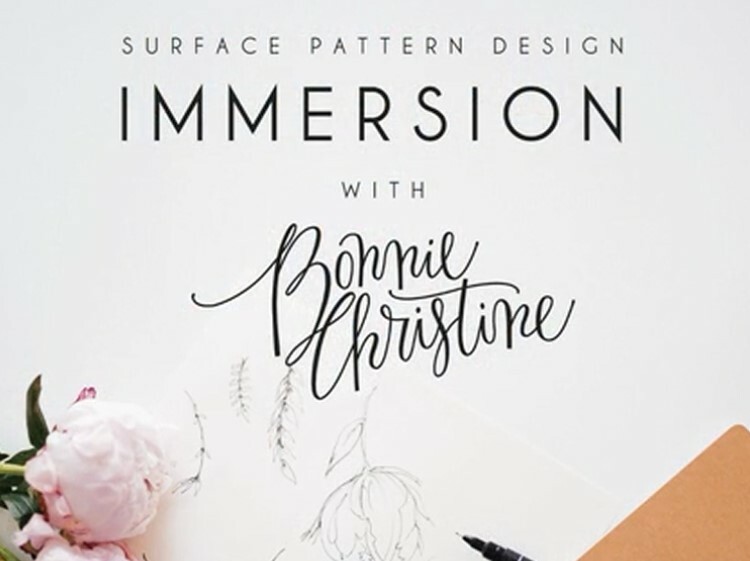 I'd love to hear about your works in progress and your favorite tools, so share away!